The crux of modern day environmentalism is that things are getting worse. Today we hear all kinds of hyperbolic claims that without action to eliminate the use of fossil fuels, we’re facing mass extinction. However, not only have environmentalists been wrong for decades, but the environment has improved significantly. If you think environmentalists are overzealous today when they (falsely) link fracking to serious health and environmental problems, take a look at their long track record of silly doomsday predictions. Civilization hasn’t ended, urban dwellers aren’t wearing gas masks, and gas stations are well-stocked. Amazingly, these environmentalists are holding strong to their false premonitions. Stanford University biologist Paul Ehrlich, one of the most outspoken doomsday prognosticators, said in the 1970s, “Population will inevitably and completely outstrip whatever small increases in food supplies we make. The death rate will increase until at least 100-200 million people per year will be starving to death during the next ten years.” While that obviously failed to come true, Ehrlich stated that “My language would be even more apocalyptic today” in 2015 than it was decades earlier. We’ve heard doomsday predictions about mankind and energy use for 45 years. Yet over this time period, we’ve increased our fossil fuel use while improving air quality at the same time. 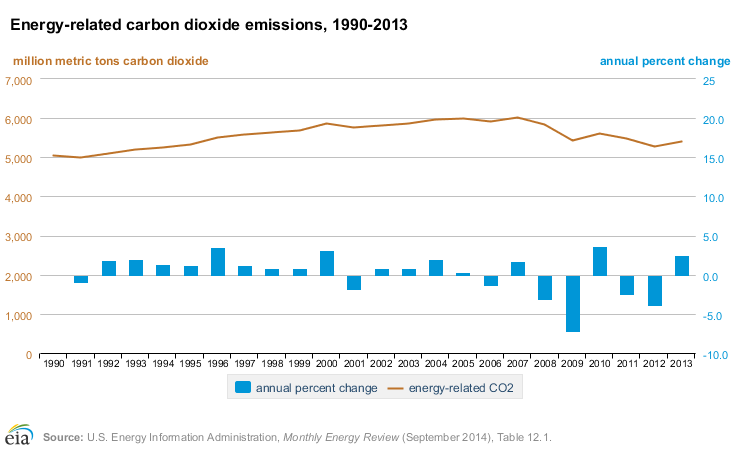 Data from the U.S. Environmental Protection Agency show air quality has improved dramatically since the 1970s. Measures of the six major pollutants: carbon monoxide, ozone, lead, nitrogen dioxide, sulfur dioxide, and particulate matter (PM2.5) have declined significantly over the past decades—even as the U.S. population and its fossil fuel use has increased. We’ve also reduced our emissions intensity—that’s the ratio of carbon dioxide to economic output, usually expressed as emissions per dollar of gross domestic product. 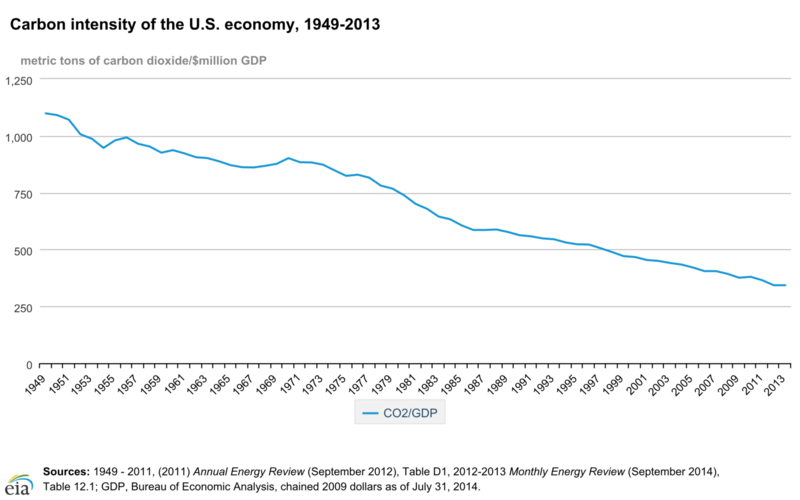 As data from the Energy Information Administration show, the carbon intensity of the U.S. economy has been decreasing steadily since the late 1940s.